Autograph signed in blue fountain pen by 1930s and 1940s actor Lee Dixon, who is best remembered for creating the role of Will Parker in the original Broadway production of the Rodgers & Hammerstein musical Oklahoma! 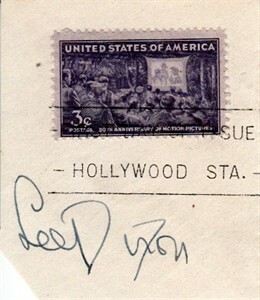 before passing away in 1953 at the age of 38, making this a very rare signature. 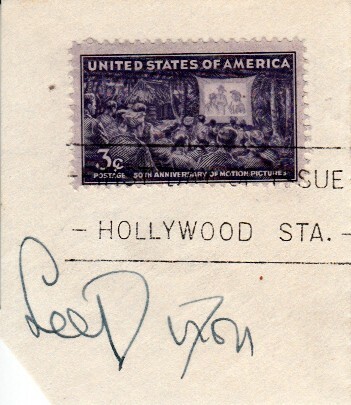 This was cut from a signed cachet, it measures about 2 1/2 by 2 3/4 inches. With certificate of authenticity from AutographsForSale.com. ONLY ONE AVAILABLE FOR SALE.